Start by opening a DS9 window before running this task and by editing the parameters for the task "gsub". a prior SN+galaxy image, to subtract the galaxy from the SN+galaxy image. This procedure involves: 1) image registration, 2) psf match, and 3) flux match. and the galaxy template image in the "template" parameter. that of the SN+galaxy image, and are self explanatory. You can restrict the region for star search using the "ssec" parameter. not used by the task. the box size to include only the outermost well-defined contour. Finally, you will get the convolved template displayed on DS9. worked fine. Hit any key to continue. 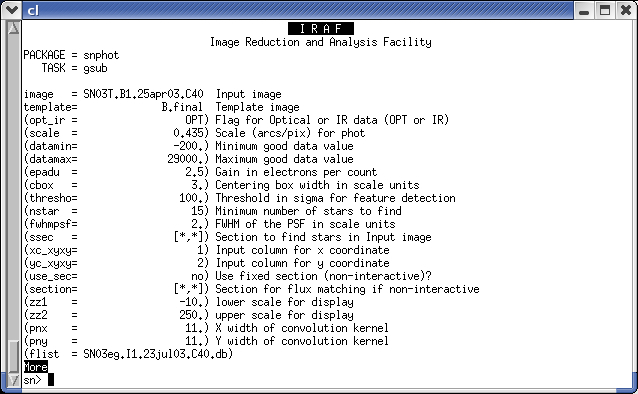 resulting image will be displayed. sky. Try to avoid including nearby local standards. you are happy with the fit you can quit with "q". The task will produce a galaxy subtracted image with the "_sub"
extension added to the original image.